Capri is one of the most beautiful islands in the world and its natural beauty of rock and panorama views are the primary reason. 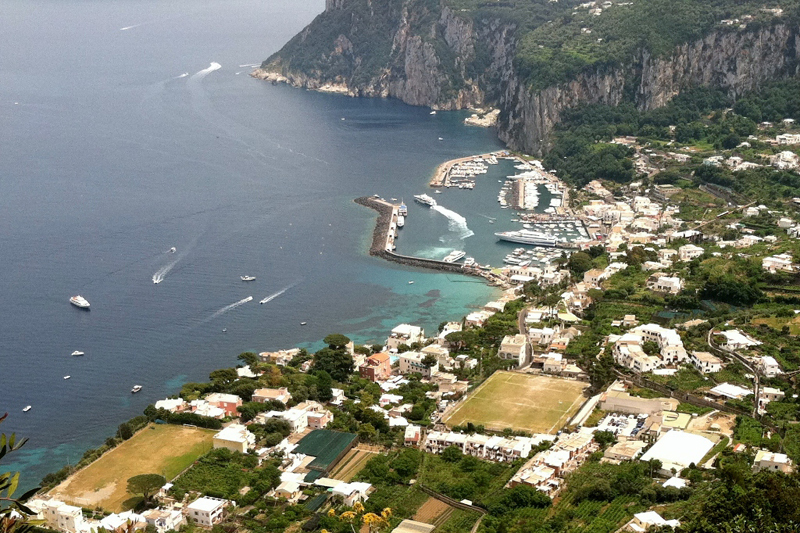 The two towns of Capri and Anacapri make up this beautiful island, and each is town is beautiful in and of itself. Both have views that are amazing and yet the very best vistas on Capri are from the highest point on the island, Monte Solaro. At 1932 feet above sea level, reached either by walking or by taking the more convenient chairlift, Monte Solaro features stunning 360 degree panorama views of Capri and the Bay of Naples. Known also as the Monte Solaro Seggiovia, the Monte Solaro chairlift station is located near Piazza Vittorio on via Caposcuro in Anacapri, near the center of town. 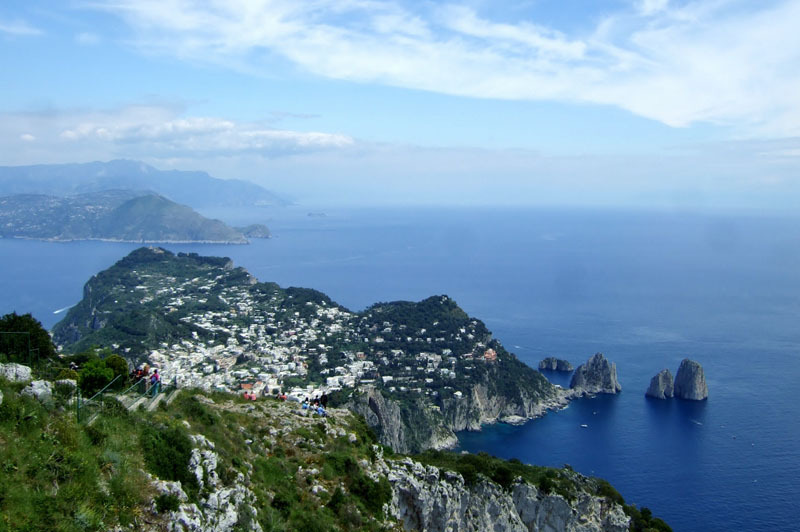 For the modest price of ten euros roundtrip, I had the thrill of my vacation during the peaceful quiet 12 minute ascent to the peak, and afterwards the 12 minute descent back to Anacapri. The views along the way are almost indescribable and the tranquility I felt was like none other. Although this two kilometer diagonal ride rises to over a third of a mile from sea level, the ground below is never that far away, so my original fear was washed away immediately. There are 156 seats capable of holding one person each, with a single non-locking metal rod which fits across once you are seated. It is similar to a ski lift except that it is only one person to a seat. The Monte Solaro chairlift was originally built by engineer Francesco Uliscia in 1952 and later modernized in 1998. At the peak, there are multiple layers of terraces where I was able to wander around at my leisure and soak in the view, take photos to my heart’s content and enjoy a snack before the return trip down. It is nice not to be rushed since this is nature at its very best and why not enjoy it to its fullest? The snack Bar at the peak is called “La Canzone del Cielo” and was originally built in the 1950’s and had a swimming pool and a solarium, as well as a restaurant and bar. Today only the bar remains with an outdoor seating area to enjoy a glass of wine, some gelato or a panini. Conveniently there are also restrooms located here. This was by far the best part of visiting Capri for me and although there are many other attractions here, I recommend that you don’t miss Monte Solaro. The small island of Capri is a must-see destination if you are traveling to the Amalfi Coast in Italy. Some of the most expensive real estate in Italy, Capri has long been known as the luxury vacation destination for the rich and famous, because of its sheer natural beauty, shopping and tranquility. I have been fortunate enough to take a day trip to Capri on two different occasions, and to say that it did not disappoint is an understatement. Capri is one of the most beautiful places I have ever seen. Its location on Italy's Amalfi Coast makes it one of the most popular tourist destinations in Italy, attracting over two million visitors in 2011 Capri has become a popular stop for travelers on Med Cruises. Most people hear about the Blue Grotto and want to make sure they see it, and truly it is one of the most amazing things to see on Capri. 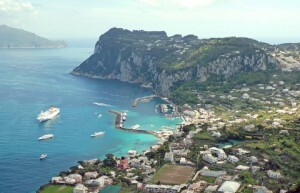 The island of Capri consists of two towns, Capri and Anacapri, both of which offer something for everyone. Here are a few of the other top attractions on the island. This is one of the best ways to truly enjoy the natural beauty of the island and the surrounding Faraglioni giant rocks that seem to emerge out of the ocean from nowhere. 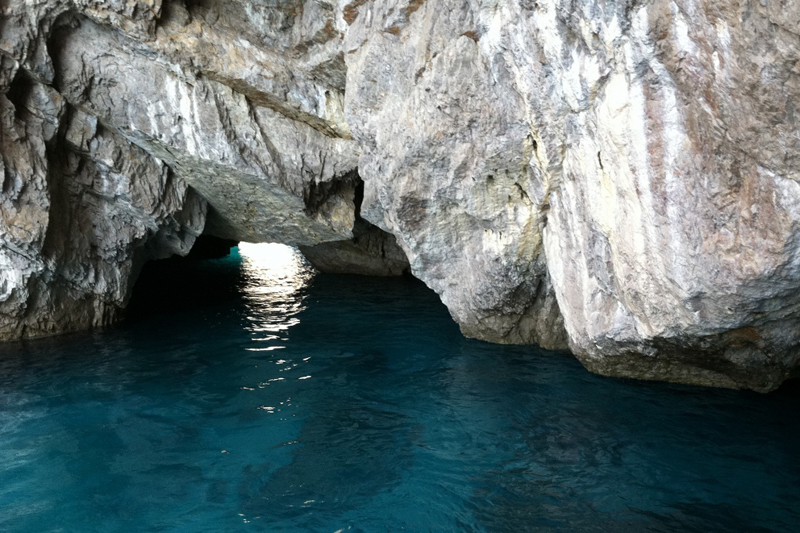 In addition to the Blue Grotto, you will pass the Green Grotto, the White Grotto, and the Red Grotto and be able to enjoy Capri away from the tourist crowds ashore. 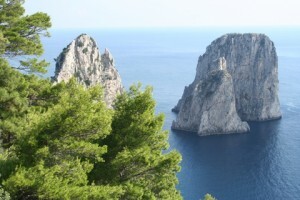 These excursions can be booked from Marina Grande, the main port of Capri. For 20 euros I had a wonderful tour of Capri and experienced a drive along the Mamma Mia road to the higher town of Anacapri. These taxi drivers and tour guides live in Capri and know the island well. I visited places that I would not have known on my own to see so I highly recommend this option. There was plenty of free time built in to shop and browse at my leisure. Do not miss the opportunity to ride the chairlift to Monte Solaro for ten euros roundtrip. The station is easily located in Anacapri near the center of town and this was definitely the highlight of my visit to Capri. The panorama views from the highest point on Capri are unmatched in beauty and the sense of tranquility from that vantage point was wonderful. This early 18th century church is one of the best examples of Neapolitan architecture and the floor of majolica tiles is truly a work of art. There is a nominal entrance fee which is totally worth it and a must-see when in Anacapri. This is definitely the most famous and also the most touristy places on the island. This cave entered by small rowboat appears blue in color as the light refracts on the water. Entrance to the Blue Grotto is always iffy depending on weather so it is a good idea to have a back-up plan. This is the other port on Capri, on the opposite side of the island from Marina Grande. The smaller ferries from towns on the Amalfi Coast arrive here and the green color of the water along with a small rocky beach is like a postcard. This small fishing community has restaurants and bars and a lovely outdoor terrace for the perfect glass of wine. The Amalfi Coast is one of the most beautiful places in Italy, and although I have been there three times, it is a place that I would want to visit again. Situated along the southwestern coastline in the region of Campania, the Amalfi Coast offers beautiful views, relaxation, wonderful food and tempting shopping. Beginning at Sorrento and ending at Salerno, the Amalfi Coast offers some of the most beautiful scenes combining cliffs and the Mediterranean Sea below. It is truly a photographer’s dream. 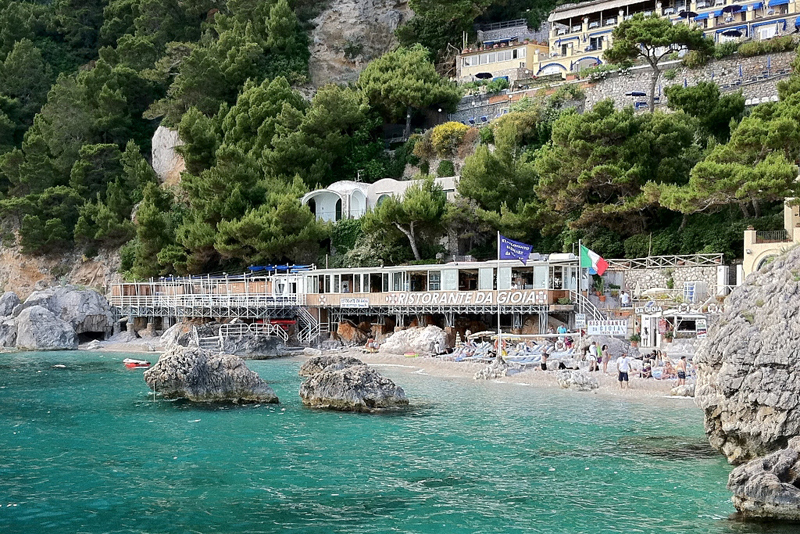 Here are some travel tips for experiencing the Amalfi Coast. 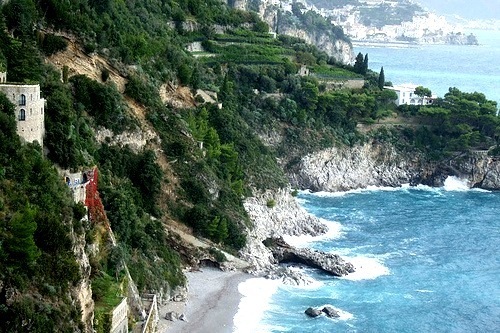 Take a bus ride along the Amalfi Coast from Sorrento to Amalfi. The SITA bus is accessible at the bus station next to the train station in Sorrento and makes a stop in Positano along the way to Amalfi. For the best views, sit on the right side of the bus for this hair-raising experience. You can board other buses from Amalfi if you choose to ride further along the coast to the towns of Minori, Maiori and Salerno. 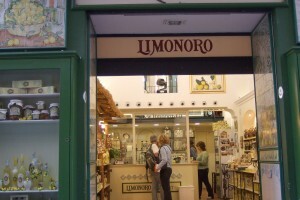 Be sure and taste some limoncello in Sorrento as this liqueur is made from the very large fresh lemons grown in this area. It is very refreshing especially on a hot day. Buy some hand-painted ceramics in the shops in either Sorrento or Amalfi. The prices are lower than what you will find in Positano. Get off the bus in Positano and walk down the winding streets to the beach (la spiaggia) to get a real feel for the town and the people of Positano. 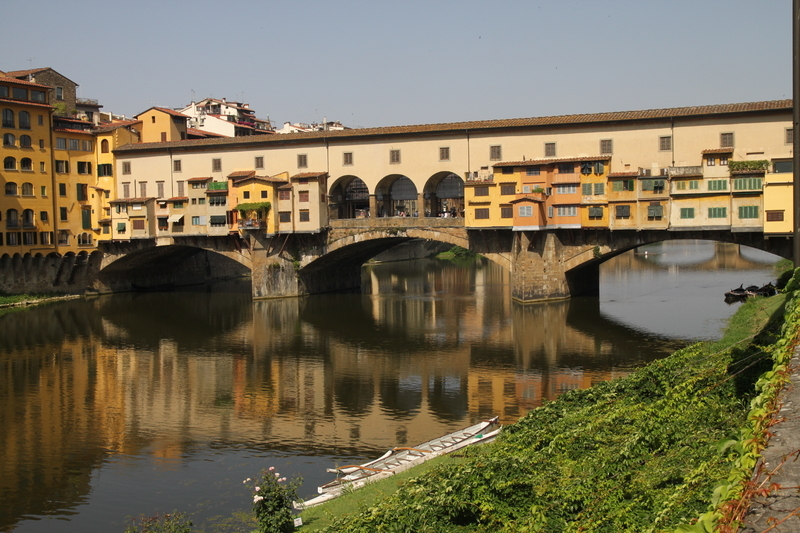 This was one of the filming locations for the movie Under the Tuscan Sun, and you can have lunch on the beach at the famous restaurant Buca di Bacco, just like Diane Lane did in the movie. 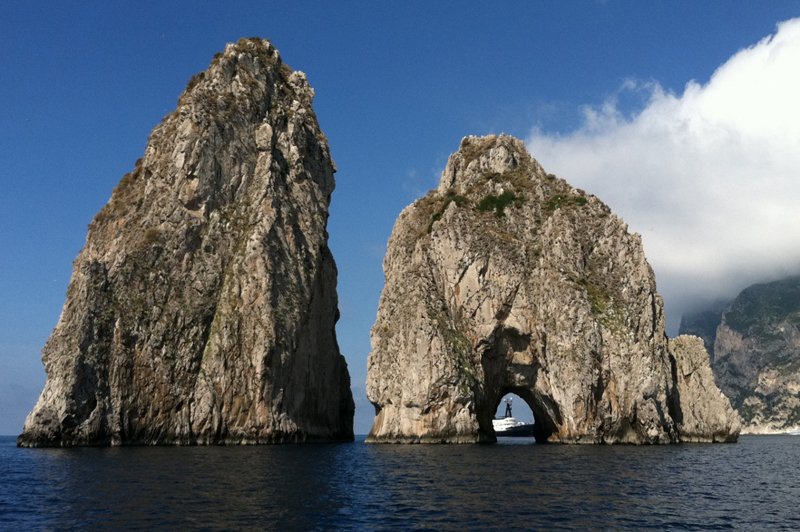 Take a day trip to the island of Capri on a hydrofoil or ferry boat from Amalfi. You will experience breathtaking views of Positano and Amalfi from another perspective. Capri can only be reached by boat and it is worth the trip. 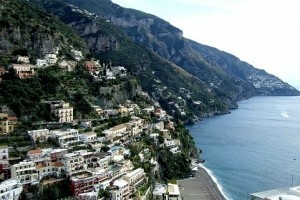 You can also get to Capri from Sorrento, Positano and Maiori as well. Avoid visiting the Amalfi Coast in July and August as these months are the most crowded as well as having the hottest temperatures. Most Italians take a vacation in August and it is next to impossible to navigate the roads. As one guide told me, the buses cannot even stop sometimes at their destinations because of the congestion, and what takes an hour and a half normally would take twice as much time driving the coast. For a quieter experience, go to the hilltop town of Ravello which is situated five km above Amalfi. You can take a bus there from Amalfi, and you will experience a complete change of pace and sound from the busier more touristy towns of Positano and Amalfi. The views are spectacular from this high, as Ravello overlooks the Amalfi coast towns of Maiori and Amalfi. 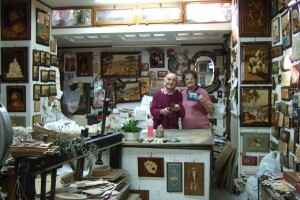 Watch the experienced artisans in Sorrento as they create by hand the beautiful music boxes made of inlaid wood called Intarsia Sorrentina. You can purchase these at excellent prices in the shops here as well. Consider staying in one of the smaller towns of Minori or Maiori if you just want some relaxation. The pace is slow and the beach is inviting, not to mention the stunning views. 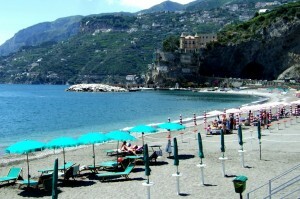 Both towns are on the bus line for easy access to Positano, Amalfi or Sorrento. 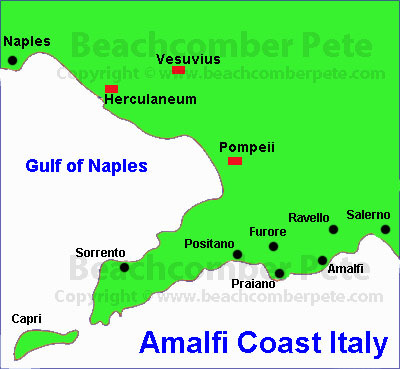 The Amalfi Coast offers so much and is one of the most popular places in southern Italy. These travel tips just are a few suggestion based on my memorable experiences in this little piece of heaven called the Amalfi Coast. Coming to Capri, and wanting to see the Blue Grotto, Being the queen of denial that I am I managed to get myself caught up in the worry about bus transfers and timetables. Before I knew it and perhaps too soon, the bus let us off at the stairway that led down to a small landing a few feet above the water. In the water there were several rowboats that were taking people off of boats, many like the raft I had refused to board, about four at a time. Every third boat or so would come to the landing where there was a line of about ten of us: then eight of us then six. I tried not to ponder the Agatha Christie implications of this countdown. I mean these people came back. Well they probably would eventually. The boats had to wait in line to go through the small opening and that took time. I was sure that eventually everyone would get back safely to the landing including me. Especially me. I hope. As the boat approached me and I realized I was next in line, I felt the nausea overtake me. I suddenly felt dizzy and light headed. See I was sick. I shouldn’t get in a boat. I probably had food poisoning or something. Never mind that all I had eaten that day was toast. As my mind scrolled through the list of reasons why I couldn’t do it I knew that every one of them was basically the same. Fear. When the rowboat came for me, I stepped into it almost without thinking. 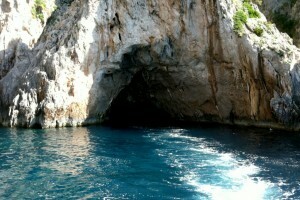 As we rowed over to the main boat to pay our money and then turned towards the Blue Grotto it suddenly it hit me. The Blue Grotto was a cave. A cave with a very small opening. Did I mention I'm also claustrophobic? Great, now I had two options. Jump out into the ocean or go through a very tiny hole into a cave. I was sure there was a lesson in this somewhere, but as we all leaned back almost prone in the rowboat while it slipped through the eye of the needle, I really couldn’t think of it. Then in one moment two things happened. First, the person in front of me, whose not inconsiderable weight had been on top of me, sat up and at that same moment I felt a sense of calm overtake me. When I opened my eyes the first thing I noticed was that all around me the cave seemed to glow with an ethereal blue light. One of the rowboat captains began to sing and the others joined in. Their deep voices filled the cave as we gently rocked on the glowing blue water. Sitting there I felt so proud of myself for overcoming my fear. I wanted to take a picture so I would forever remember this beautiful place. For the rest of my life this blue glow would represent peace. I knew I needed to capture the color so I would never forget the beautiful hue. I reached for my camera…and realized that before I had left the hotel this morning I had loaded it with black and white film. Have you traveled to Capri? 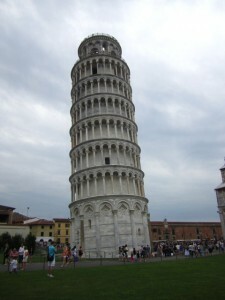 Visited other parts of Italy? Do you have any advice or recommendations for our readers? When I arrived on the Isle of Capri after a 45 minute or so ferry ride I was still debating whether or not to visit the Blue Grotto. One of the more famous sights in Italy, a country with a large number of famous sights, the Blue Grotto is supposed to be unforgettable. Because of this the decision of whether or not to visit it was basically a no brainer except for one thing, the water. It’s not that I don’t like water. I love to admire it from afar and sit next to it; I even like to drink it. The problem is I’m kind of afraid of it. I can go on ferry rides and cruise ships, but when it comes to smaller boats on open water I get a little nervous. A quick trip to the dock told me all I needed to know. The boat my group planned to take to the Blue Grotto was essentially a 10 by 10 foot base with a bunch of chairs bolted onto it. According to the captain this glorified raft would take us around the island to visit a variety of sights. After this ‘three hour tour’ as it were, we would then head out to the Blue Grotto area. Once there, we would climb off of the raft and get into a tiny rowboat that would hold about three or four sightseers and a ‘captain’. I acknowledge that at times I’m prone to panic. Most of these times have to do with water. Like the Wicked Witch of the West, it is my Achilles heel. While I realized there was no way I was getting on the raft, I didn’t want to give up completely on seeing a place as amazing as the Blue Grotto. There had to be another way. Teaming up with another hydrophobic, we decided to head up to the village of Capri to see if there was some way for us to get to the Blue Grotto that didn’t involve a raft. I did realize I would still have to get on a boat to go into the Blue Grotto, but I figured I could deal with that when the time came. I am excellent at denial. We boarded the funicular railway for the trip from the port up to the town of Capri. We asked at a shop there and were directed to a bus that would take us to Ana Capri. Once in Ana Capri we had to switch buses to catch the one that would take us to the Blue Grotto.